Chart Wealth... Multimedia Network Index Has Line On Profits! April 2006, Volume 3 Issue 4 Know It - Profit! "Multimedia Network Giant QUALCOMM Rides Wave To Profits!" I've been forecasting the monumental gains of the Russell 2000 all quarter! Did you get your share of the profits? Also... this month I use Elliott Wave analysis to uncover the next major move for QUALCOMM Inc.
And... over the months I've featured numerous stocks, providing real examples of technical analysis you can use. So, how have those trades played-out? I'll show you in this months "Where Are They, Now?". The Russell 2000 (^RUT) punched through the double-digit barrier, banking an impressive 12.9% gain for the quarter! The Nasdaq Composite (^IXIC) benefited from a 6.1% hike. Also, the Wilshire 5000 (^DWC) grew a respectable 5.1%. The Dow Jones Industrials (^DJI) and the Standard & Poor's 500 (^GSPC) both advanced 3.7% for the quarter. Where are the Dow Industrials going, next? The PHLX SIG Steel Producers Index (^STQ) ended the quarter with a whopping 42.4% gain! The AMEX Gold Bugs Index (^HUI) is riding high on 21.5% of growth. Additionally, the AMEX Securities Broker/Dealer Index (^XBD) has improved 16.9%. The CBOE GSTI Multimedia Network Index (^GIP) and the PHLX Semiconductor Device Index (^SDL) have captured 15.6% and 14.9% profits, respectively. Now... you've seen this quarter's leaders. Who's been lagging? QUALCOMM Inc. (QCOM) leads the Multimedia Network Index this month. The Stochastic RSI (green line) is simply an oscillator that measures the level of the relative strength index (RSI) relative to its range over a period of time. It is useful for timing the beginning of each wave. The Demand Index (DI) (thick red line) incorporates momentum and volume. An increasing DI correlates to a stronger trend. Also, it helps to pinpoint wave tops and bottoms. Time Projections (gray histogram with red horizontal bars) help identify whether a wave is unfolding as forecasted. If the histogram goes beyond the bars, the wave has possibly entered an extension and may be prime for a reversal. The Elliott Oscillator (green and magenta histogram) is the difference between a 5-period and a 35-period exponential moving average... the higher the reading, the stronger the wave. A 14-period RSI is overlayed, as well. Volume is an often neglected indicator. Look for increased volume at the beginning of each impulse wave. Currently, QCOM is trading within a minor third wave. An intermediate fifth wave inside a major third wave is propelling the stock forward. 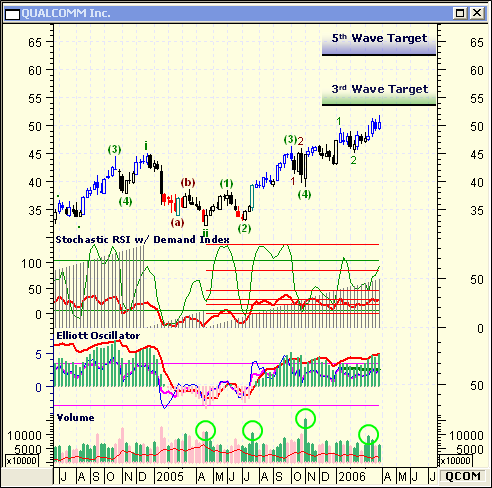 Anticipate a $15 gain as QCOM trends up to its minor fifth wave target. Beginning this month, I'll keep a running tab on past trading examples found in the Featured Chart section of Chart Wealth. Not all trades will be winners. Therefore, I can't emphasize enough... money management techniques should be included in every trading plan. NEVER trade without a protective stop. An 8 - 10% stop loss order is sufficient.